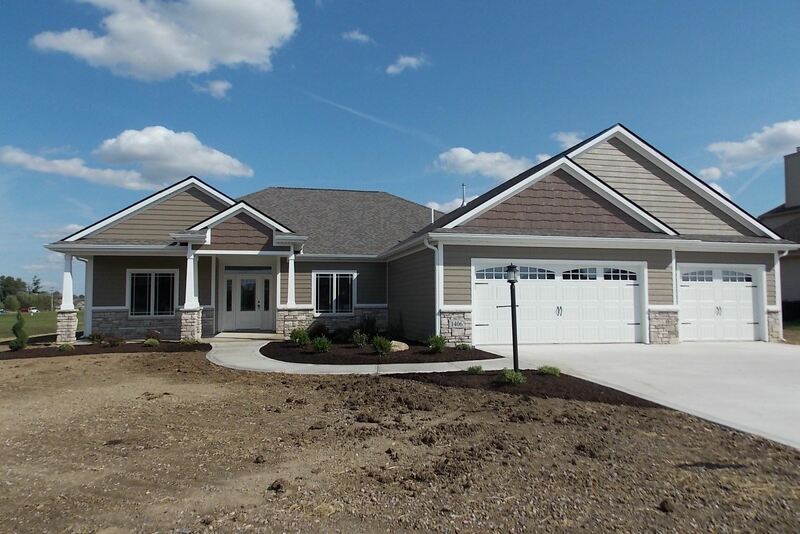 Gorgeous new spec home with all the nice amenities and a 4 CAR Garage built by Tom Schmucker & Sons. Open split 3 BR floor plan with a den. Spacious GR that opens directly to a large kitchen with island and spacious semi-formal dining area. Center island kitchen with custom cabinetry by D & B Cabinets with soft close drawers. Den features a small closet, bookshelves & glass french doors. Kitchen has a walk-in pantry, granite countertops and desk area. Master bedroom suite has treyed ceiling, 2 tier closet, tiled shower with rain head and large double vanity with granite tops. Large front porch will accommodate nice furniture plus a covered porch that can be screened or enclosed. Amazing garage with workshop area, a 38 ft. deep 3rd bay area & floored attic space. Other features include Andersen 400 series windows, 50 gal. HWH, Hi-Efficiency Furnace, Garage doors with glass inserts and extra wide pull-down attic stairs. Make this your stunning new home!! A MUST SEE if you are thinking about building! !